I don't know about you but I think this little beauty came quite close to perfection. Pebble Beach Food & Wine, see you later this week? Thanks everybody for your comments and emails about the Iron Chef episode last night. It really was a lot of fun, and the food was really, really good (on both sides, they put up a great fight)--and my goodness did I really have that much makeup on? (And I've just realized that I say really quite a lot!) I'll have to tell you more about it later, and there will be another one you can watch later on this season too. I'm under a pretty serious deadline this week so I won't have time to go into much details, but I will soon. Meanwhile, I wanted to tell you about my fun plan later this week at the fabulous Pebble Beach Food & Wine festival. This is the first year of this premier event, but we should expect no less than great things from the folks who ran the famous (and dearly departed) Masters of Food and Wine in Carmel for years and years. David will be cooking at a couple events, while I'll be playing down there with the folks from Foodbuzz and my friend Joey Altman. We'll show you all the fun stuff and will even be taking you guys behind the scenes at a soooper exclusive event. Stay tuned right here chez moi! P.S. If you're down there and see me, do come and say hi. What, you haven't got your tickets yet? Well, what are you waiting for?? Watch Iron Chef this week! Of course you want to! I'm one of the judges! Next to me on the panel was Jeffrey Steingarten! I've had a (food writer) crush on Jeffrey Steingarten since I was a geeky grad student in San Diego!! Can I use any more exclamation marks on this one post!?! Evidently!!! It's Iron Chef Morimoto vs. Tyson Cole. This Sunday night at 10PM. I can't possibly say one more word about this because I might let the secret out! Oh, wait, actually I am kind of good at not letting the proverbial cat out of the bag. When I went to New York to film two episodes(!) of Iron Chef last summer, I literally tripped over the giant portrait of the Next Iron Chef winner, and that was September, before the first episode of the show even aired. I never let on that I knew who won it, did I? Did I? P.S. The picture above was shamelessly swiped from Louisa's blog. Thanks dahling. I must confess to you I was never a big fan of kumquats, that is, until I was introduced to a very special tree. Not a kumquat tree exactly, but a mandarinquat tree, a cross between--you guessed it--mandarin and kumquat. Kumquats are very fragrant, but the astringent skin and acidic flesh never did much for me. One bite into a mandarinquat from that tree, however, won me over entirely. I was seduced by the amazing fragrant and the astonishingly sweet rind. There was still a tang from the acidic flesh, but only just enough to add intrigue without being overwhelming. I ate handfuls after handfuls that day, right from the tree--like candy, albeit a very grown-up kind. Besides being far more flavorful than regular kumquats, mandarinquats are also quite a bit prettier. Instead of the pale yellow skin and simple oblong shape of the kumquats, mandarinquats are rounder and more like a tear drop in shape, with deep orange, mandarin-like skin. I also find that mandarinquat's rind is a bit thinner than kumquats. I went up the hills to visit Gene at his fabled citrus grove this weekend, and of course I stopped by to say hi to the tree. It's still bearing loads of fruits, but I knew the season was nearly over. I must do something to stretch it just a bit longer. So, I came home with a big bagful of mandarinquats and set out to candy them. Sometimes it really doesn't take much to make me smile. This little packet of coffee grind arrived with my coffee delivery last week, with a note.. If you weren't expecting a grind sample, surprise. Some call it micro managing. We like to call it attention to detail. The coffee came with customary notes about the week's selection, brewing instructions, occasional chocolate truffles, and, once in a while, a little reminder that life is sometimes just these mundane little details. How sweet. Basically this is a very similar recipe to the braised pork belly I posted last week. Using the five spice powder as a base, and chicken legs and thighs in place of pork belly. Because chicken is less flavorful than pork, in addition to the onion and ginger I also use a paste of garlic, cilantro roots, and peppercorn to add a bit more flavor to the braising liquid. 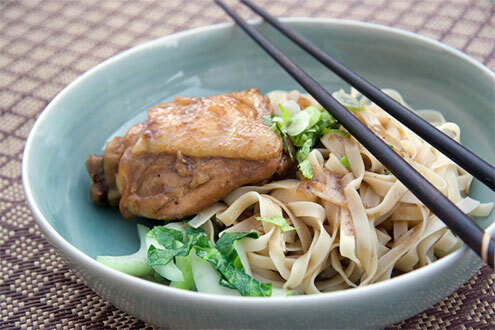 I like to serve the braised chicken with egg noodle and crunchy blanched bok choy. Whereas pork belly is not something you want to make multiple meals of--unless you're on a quick weight gain regimen for your upcoming Sumo match--you can easily get three or four weeknight dinners out of a big pot of this braised chicken. Just change the carbohydrates and vegetables and you have a new dish every night. I've even once pull apart the meat from a thigh and use it to make a chicken sandwich, a sort of improvised Chicken Bahn Mi. This is it, the best darn cooking show online. Ladies and gentlemen, meet John Bull and his Reggae Kitchen. I'm entirely serious. I've seen a lot of cooking shows on the web and let me tell you nobody got my attention like this guy did. Hardly anyone on TV does anymore either. I found him earlier today, and just watched his entire line up. He's great! Watch him fry dough in lard with Paula Deen's abandon, but he did her one better by breaking into a little impromptu reggae tune even gave us a little dance..
Adorable! He's even got an Emeril moment in there--well, Emeril before the annoying BAM! took him over entirely--telling the audience to add just a leetle beet of cari pow-dah in da saltfish while dumping it on without missing a beat, like Emeril winking at the audience with his, just a little cah-yeane. From what I gathered he's got a Jamaican restaurant in Stockholm. Go figure. He has a bunch of shows up on Dayrobber.com, a Swedish Web TV site, I embeded one video here, but you should go watch them all! P.S. I just read this post I realized I didn't say enough about the food. It looked great! You can really tell that he's really a cook and he just loves what he does. It's also fun watching him fumbling around in his well-worn and well-loved kitchen, pulling a pan from the bottom of a big pile and somehow not toppling the whole thing over! The usual caveats apply and all that, but, in my opinion, I might have finally eaten at what was quite possibly the worst restaurant in the world. Not that I wasn't forewarned; I should have taken note when Rafael Garcia Santos, the One Man "Michelin Guide" of Spain, contorted his face into something quite indescribable when I told him we were going to eat at l'Esguard. I should have listened to many other concerned souls who pointed out that Roses—and the legendary elBulli—was really not that much farther from Barcelona. One person pulled out a mobile and offered to get us a reservation, even. Alas, I was determined, pigheaded, I should say. I had already been to elBulli, but was yet to try l'Esguard. We were sticking with our plan, we would not be swayed by anyone, not even the lot of them. Our resolve was, sadly, resolute. You could hardly blame us. The chef, Miguel Sanchez Romera, has a back-story that is more than intriguing: a brain surgeon by day, and an haute cuisine chef by night. Ok, it's more like two and four days a week, respectively, but you get my drift. Quite an iconoclast, Sanchez Romera famously denounced the inclusion of his restaurant in the Michelin Guide for Spain. Whether he had done that pre or post the not-so-favorable mention in said guide is up for question, however. I knew things began southwards not long after we entered the beautifully restored 16th century building. Lining the walls of the reception room were photographs of the food. Beautiful yet strangely sterile, they were blown up, spotlighted, and posed as if to demand no less than worship from the unsuspecting diners passing through the corridor. This is such a simple recipe you might think I'm not revealing all the secrets. Trust me, I am. I gave you the recipe for my super secret Five Spice powder didn't I? I'm sorry to have kept you waiting a while. I just had another nasty bout of flu that got me totally down for the count. I was barely coherent enough to speak, let alone blog. Anyway, all is behind me now. To those of you who've been following the alarming Status Message on my Facebook, I'm fine now. And, no, I didn't have bird flu, I was just being a cry baby, sorry if I scared anyone. Now, back to the long awaited braised pork belly, shall we? Once you've made the Five Spice powder from part I of this post, this dish is total child's play. (Even if you didn't make your own Five Spice powder you could easily substitute the store-bought stuff. Won't be as good and it will do.) Once the braise it done, you could serve it on top of rice noodle, or any other kind of noodle that you like. You can even serve it on rice. I usually make a little chili-garlic-vinegar condiment to serve on the side. It adds a nice tang to cut through the fatty goodness in the belly. Should you want to buy the guide you'd still have to wait until Thursday, but the cat is out of the bag today. After rampant Internet speculations--which this year had been more fun than usual with bonafide journalists and even a facebook group joining the fray--the real deal is out. There is only one three star promotion, which goes to Gérald Passédat at Le Petit Nice in Marseilles joining the exclusive club. The rumor of the demotion of the century--yes, yes, I know it's young yet mais quand même!--about l'Arpège being demoted to the lowly two-star status turned out to be false. Although the surprising promotion of what is essentially a chain restaurant, l'Atelier de Joël Robuchon (the one in Paris), getting its second star has now been confirmed. On the actual demotion front, Le Grand Véfour got it. It's now a two-star restaurant with Michelin citing problem of consistency to back its decision. Another rumor that had Phillipe Legendre at Le Cinq getting back his third star Michelin took away from him last year also turned out to be false. Michelin seems a bit stingy in its three star promotion this year, compared to the whopping five new restaurants joining (or rejoining) the rank last year. Perhaps they are waiting to make the big splash next year in their centennial guide? We'll just have to wait and see. The only new 3-star Le Petit Nice also joins the exclusive group of fish-centric restaurants with three stars: Le Bernadin in Manhattan and Olivier Roellinger's la Maison de Bricourt in Brittany. I'm not counting the sushi restaurants in Tokyo though. PDF file of the whole list of one, two, three stars and bib gourmands and whatnots, after the jump.